Shawn formed Patey Law Group in 2002 after spending over a decade practicing insurance defence litigation, both privately and in-house. In addition to overseeing the legal team at Patey Law Group, Shawn focuses on consultations and resolution of claims. He conducts Examinations for Discovery, Mediations, Pretrial Conferences and Trials. 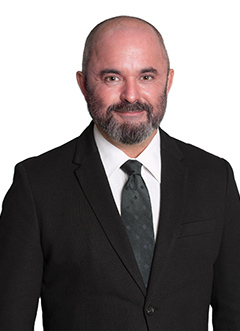 He has extensive experience at various levels of the Ontario Courts throughout the province, in addition to his work before tribunals such as the Financial Services Commission of Ontario, Social Assistance Reveiw Board and WSIAT (formerly WCAT). Shawn received his Bachelor of Arts from Memorial University of Newfoundland in 1987, and then obtained his Bachelor of Laws from Queen’s University in 1990. He was called to the Bar of Ontario in 1992. Shawn is also a Master of Laws (Energy and Infrastructure) Candidate, Osgoode Hall Law School, York University with his expected graduation in 2018. Shawn has also been a proud member of the Newfoundland Bar since 2009. He is an active member of the Canadian and Ontario Bar Associations, Canadian and Ontario Paraplegic Association and the Canadian Council on Aboriginal Business. Shawn practices insurance litigation, with a special focus on personal injury. He has extensive experience in insurance defence litigation, which gives him unique and invaluable insight which he uses to the benefit of his clients. His knowledge and insight allow him to expertly advise and guide clients through all stages of litigation. To keep informed with changes in the applicable laws and regulations, Shawn attends conferences and seminars, in addition to frequently reviewing relevant publications in the area. Shawn is a Status Indian, and a founding member of the Qalipu Mi’ Kmaq band of Newfoundland and Labrador. Paula is the Marketing Director for Patey Law Group (PLG). In addition, she is the Founder and Director of Operations / President of Accident Resolution Group, Stamp & Associates PC (ARG). She is an active member of the Law Society of Ontario and the Ontario Paralegal Association. As a graduate of Centennial College, she is a member of the advisory committee to the Law Clerk/Paralegal Program at the College. She has appeared regularly as a panel member for the LSUC, Continuing Legal Education, Paralegal Society of Ontario and Centennial College. She is a past recipient of the Crystal Award for Inspirational Woman, an award that honours women who have made outstanding achievements in specific fields and in doing so have contributed to their community, business, friends and/or family. Paula is a past recipient of Centennial College’s Alumnus of Distinction Award and nominee of the Colleges Ontario’s Premier’s Award for achievement in business. Paula is passionately committed to fundraising for Autism Speaks Canada. In 2008 she founded Team CJ and participates annually in the Walk for Autism. She is also the founder of “Under The Big Top for Autism” Annual Gala – www.autismgala.com. Team CJ has won numerous awards as Canada’s top fundraising Team and has raised over $500,000.00 that directly benefits the Autism Community. She is the founder and donor of several scholarships and initiatives that benefit; the legal community, college graduates and aboriginal youth/women. Paula has been practising for over 20 years. We are here to help and assist you no matter what your situation. Don’t wait any longer, arrange a consultation with us today!